I decided to restart the thread to make it easier for lurkers to search and find what were my common questions. 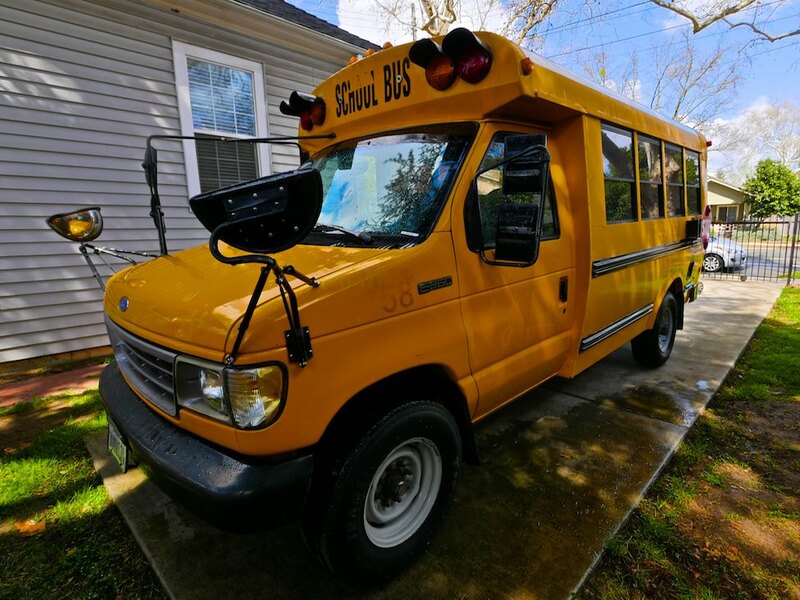 I scanned Craigslist for "bus" every week for quite some time, and there were definitely some good options on there. But none worked out, either because of distance or size or price. I eventually did a Google search for "Bus Dealerships" in my area, and found a dealership that had an office in my city. They also had an office in Los Angeles, and they happened to have two short busses that actually exceeded my requirements. I called them up, asked if they could deliver it, but they couldn't due to the price (they were trying to get their money back and didn't want to spend any extra time on it). Well, fortunately for me, I was going to Las Vegas for a work conference, and decided to drive through LA on my way back up to Northern California. What's the condition of the tires, brakes, belts, engine? Does the heater/air conditioner work? They were very explicit that it was sold as is, meaning no warranty, but they also wouldn't leave me hanging out to dry if it blew up on the drive back home. I agreed to buy it for their asking price of $2,500 and scheduled a time to visit when I would be driving through. I showed up, gave it a test drive down the highway (I wanted to make sure it could hit 60, which it did no problem), and liked how it handled. They did not accept personal checks, so I paid partially in cash and used a debit card for the rest. They would've accepted a wire, too, but that would've taken too long since I wanted to drive it away that day. After we closed the deal, and filled out the appropriate DMV paperwork and paid all taxes and fees, they handed me the keys and gave me a one time use permit to drive it from the dealership to my home. Before I drove away, however, I called my auto insurer and obtained insurance for a Ford E-350 Econoline. The automatic insurance system didn't recognize the VIN number, probably because it's so old, so I had to call in person to get it done. Insurance came to about $300 a year. Not bad at all. In California, I had ten days to register it with the DMV. Once I made it home, I visited a private DMV rep (Registration Express Group) with all the paperwork and paid $150 for the registration and the convenience of not waiting at the regular DMV (totally worth it). I registered it as a regular auto. That's right. Not a camper van. Not an RV. No inspections necessary. I just brought in my paperwork from the dealership and my debit card, and walked away with the registration and license plates. 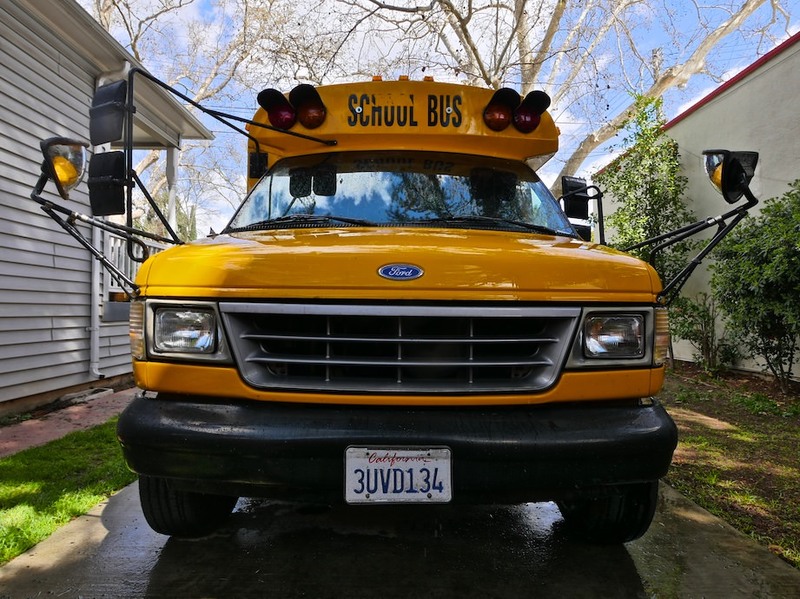 The last step before being able to drive it around is paint it a color other than school bus yellow. Apparently, even with all the decals removed and lights disabled, it's still illegal to drive a vehicle that color. So once I got the paint on, and put the license plates on the bumpers, she was totally street legal and good to go! What was the name of the dealership that you went through? A 4 window, single rear wheel 7.3 Ford diesel sounds great. Is your Girardin aluminum skinned? Thanks. 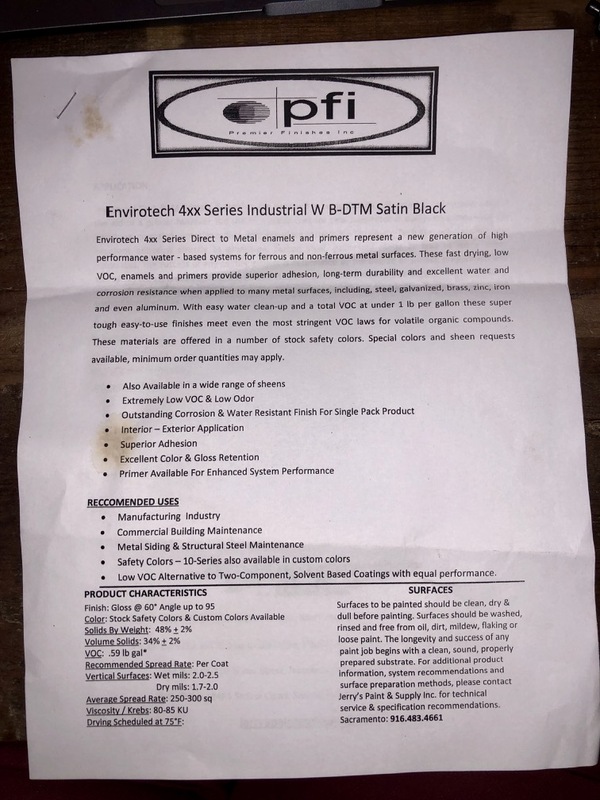 Is it written in the legislation about the color? Only reason I ask is because Stanley Steamer carpet Vans are that same yellow. I'm looking forward.to following your build. 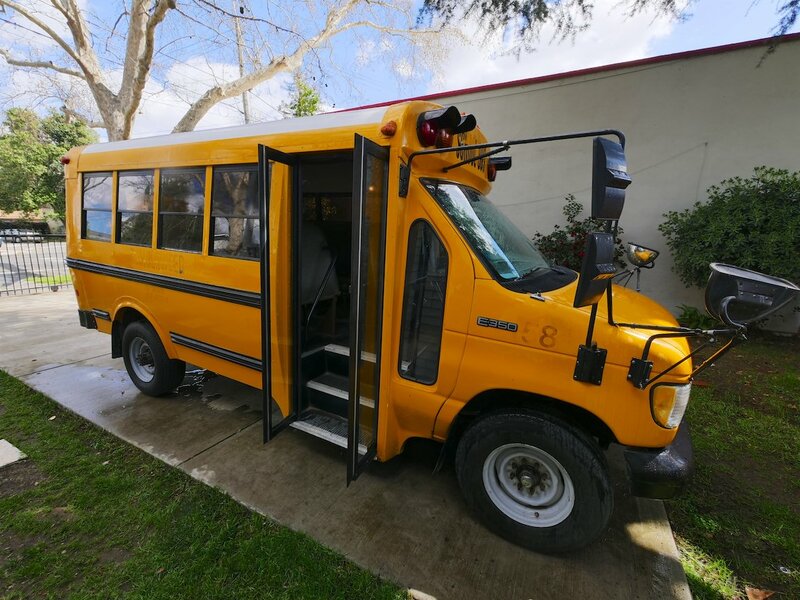 I bought it from A to Z Bus Sales in Colton, CA. 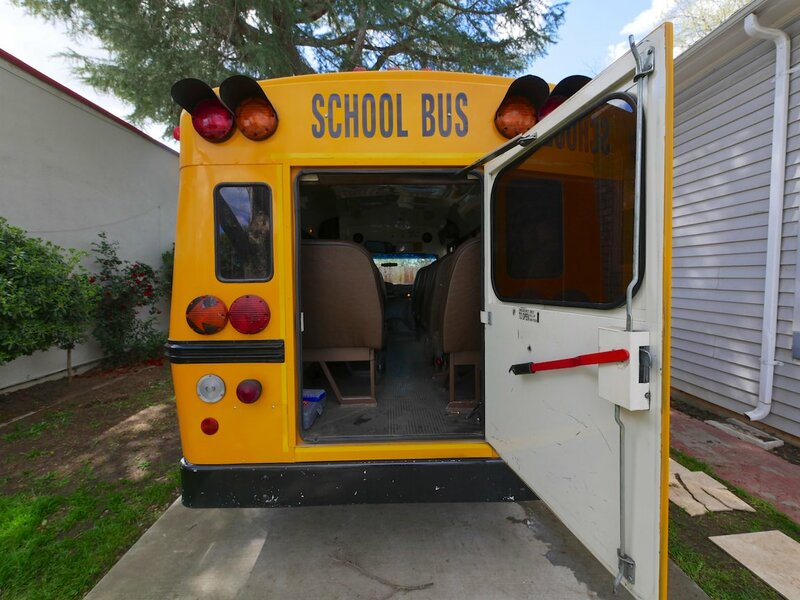 They also have a Sacramento office but they only sell used buses at their Colton location (as well as new, including full sized electric busses!). I think they still have one left! 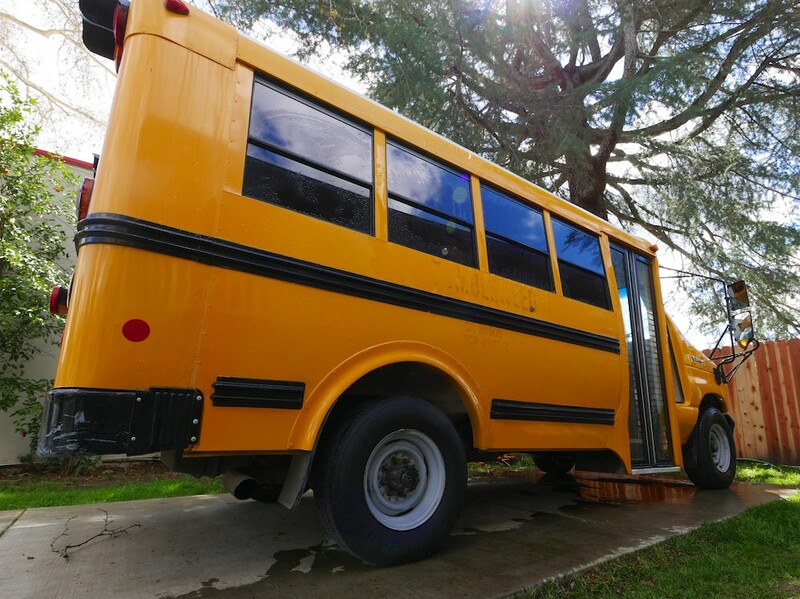 It might be that a school bus can only be that yellow if operating as a school bus--so other vehicles, such as cars and vans, could perhaps be that yellow no problem since they're not buses. Is your Girardin aluminum skinned? Is there any easy way to tell if it’s steel or aluminum? There are a few sheets of metal on the bus that I’m not sure about. Steel is ferromagnetic, aluminum is not. Grab your favorite bottle opener off the side of the fridge and see if she's attracted to your panels. I guess the color is an issue. That's rough. This was a two person job. There really wasn't any way around it. 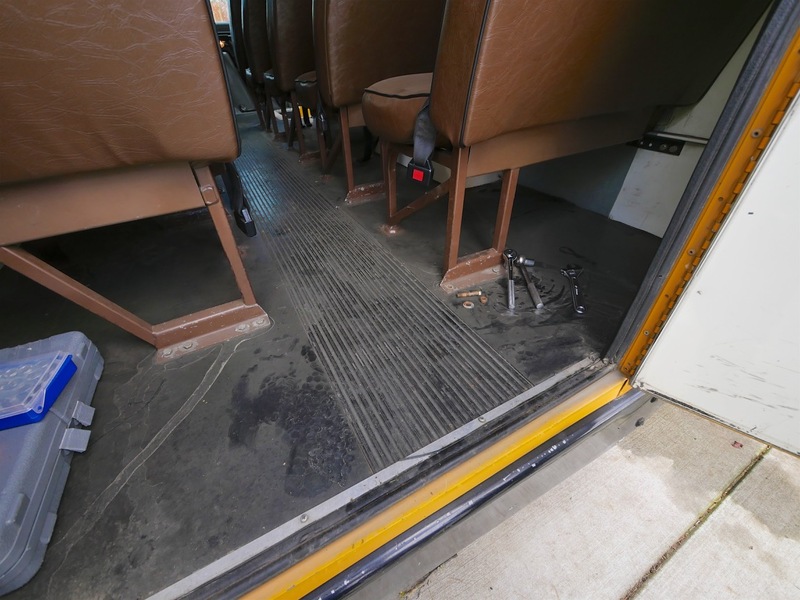 One person went below the bus, used a wrench or a ratchet to hold the nut in place, and the other undid the bolt from the cabin. 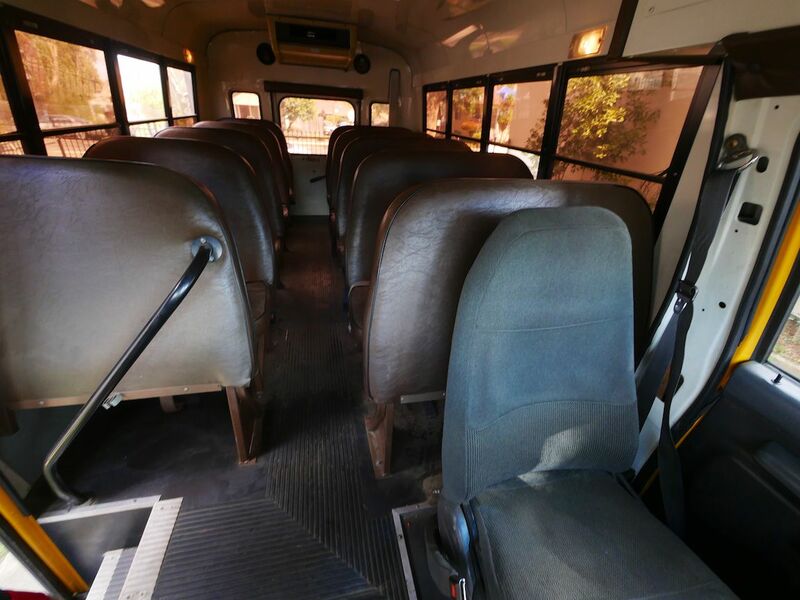 I'm keeping two of the seats to put back in (with new cushions), and that's also some fun scrap metal to use for various projects. I sanded the entire exterior with a random orbital sander using 150 grit sandpaper, then wiped it down with xylene (any solvent will do, such as acetone--xylene is quite stinky, so it goes without saying wear nitrile gloves and a respirator). After that I taped it up. I ended up going with a DTM Acrylic water based paint, obtained from an auto paint shop. I thinned it with about 10% water, and used a spray gun/air compressor combo with a 1.8mm tip. Every hour or so, I had to clean the tip from all the gunk that dried, and I put on two coats total. This was my first time using a spray gun, and you can definitely tell this is an amateur job--I let the compressor hose scrape the fresh paint, and quite frequently it dripped because it wasn't mixed properly. If I were to do it again, I'd use Floetrol and a hardener. And move slower. And perhaps tape things up better. And pick a better day when there wasn't so much pollen in the air. 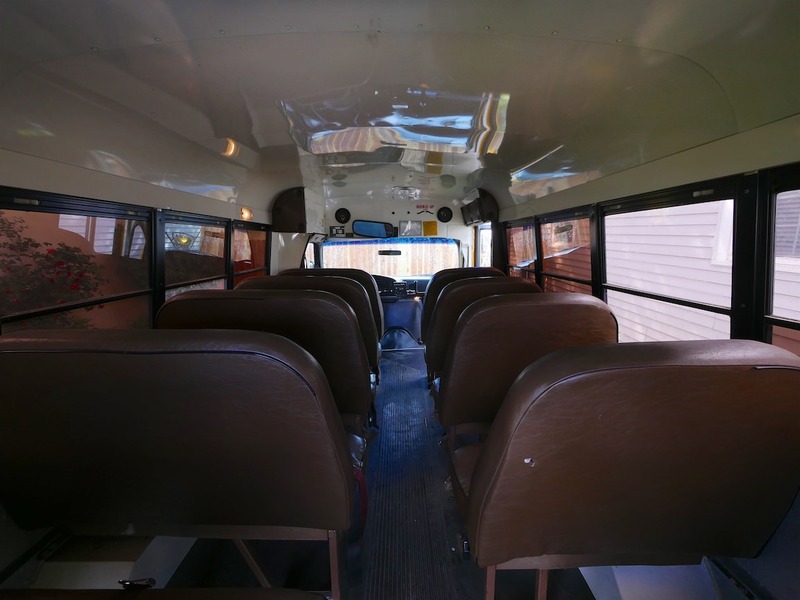 The paint itself (on my 22 foot bus, I used about 1/2 gallon for one coat of paint), a thinner (which not only makes it flow easier on your brush or spray gun, but also lets it absorb more into the surface you're painting), and a hardener (which helps protect against the sun, rust, and also decreases drying time). Use a ratio of 10:1 paint:thinner, and a 15:1 paint:hardener. So 1 gallon of paint would mean adding about 3/4 pint (12 ounces) of thinner and 1/2 pint (8 ounces) of hardener. The previous items are just recommendations, there are many substitutes that will work. It may be different if you're rolling the paint on, or spraying it, or using an airless sprayer. Follow the labels for the product you choose. I used less than 1 gallon of the acrylic paint and thinned it with water, and that worked fine with a sprayer. But I wish I had taken the time to do it right, and used both the Floetrol instead of water, and the acrylic enamel hardener. 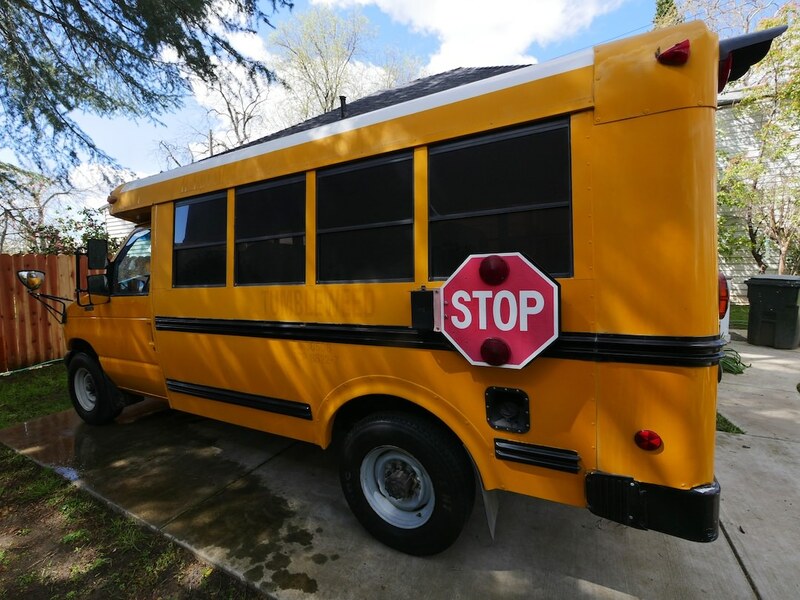 For my 20 foot bus, I used about 1 gallon of paint. Once I'm done cutting and installing all the ports and cabinets, I'll put two more coats on and call it good.